Bubble Glass Pillar, Taper Candle Holder. H-8", Pack of 12 pcs Discounts Apply ! The stem candle holder has its brilliant simplicity, this is what the designers and brides cannot resist. This clear glass pillar candle holder is perfect for displaying your pillar candle (D-4.5" or smaller) and it's ideal for both wick and LED candles. 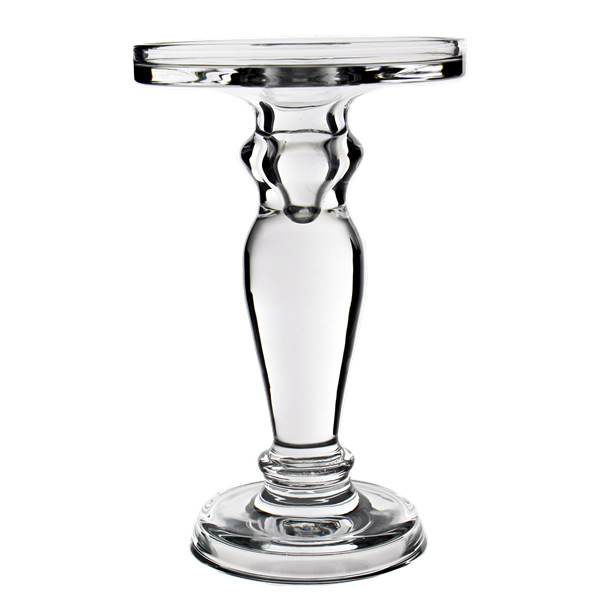 Dual purpose candle holder can be used for pillar or taper candles. You will find a slight lip and an indented center for potential wax spillage. Dimension: H-8", Base D: 3.75", Plate D: 5", Plate Opening D: 4.75"